Join us to officially kick off enrollment for the 2019-2020 school year and our summer programs. Limited spaces available in most classes, ages two through sixth grade. Come see our classrooms, meet our teachers, and start the enrollment process. 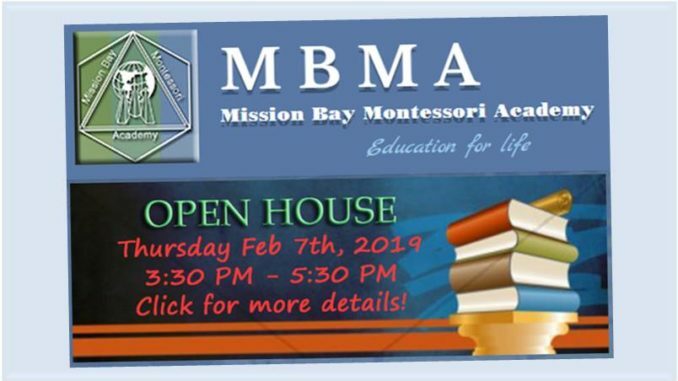 Courtesy of Kristie Miller, Principal, Mission Bay Montessori, 2040 Soderblom Avenue, University City, San Diego, 92122; for more information, visit https://www.mbmacademy.com/ or call 858-457-5895.